Address: 9400 Sopron, Várkerület 75. 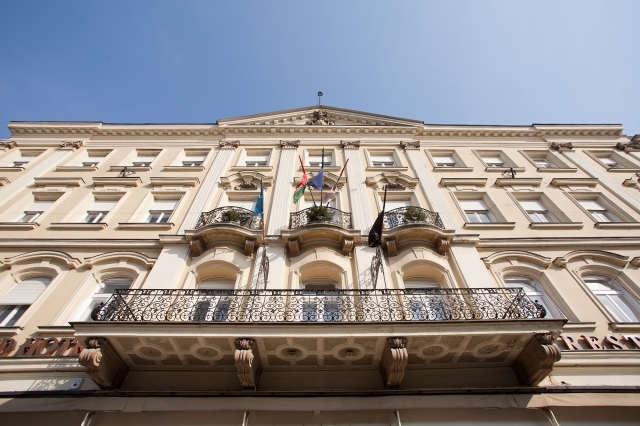 In the heart of the historic town, this hotel, built in 1893, is the oldest in Sopron. It offers a fusion of traditional and modern hospitality. Free Wi-Fi and a spa area are provided, as well as a private garage. The hotel includes individually furnished rooms with a flat-screen TV, a minibar and a bathroom. Some come with antique furniture. In summer, the hotel opens its terrace and the roof-garden with its sunbathing terrace. There is also a restaurant which serves a breakfast buffet and a 3-course dinner option. Guests can enjoy the café, open during the day. Close to the Austrian border and a one hour drive from Vienna (43 miles), the hotel is west of Budapest (137 miles). During your stay, you can explore the historic quarter center of Sopron, rich in monuments. Standard single room with classic-style wooden furnishings have a minibar, LCD TV and a private bathroom. Free Wi-Fi is available in all rooms. Standard double room have simple furnishing and are typically smaller rooms with minibar, LCD TV and a private bathroom. In this category the hotel offers single-, double and twin beds. Free Wi-Fi is available in all rooms. Standard quadruple room features 2 bedrooms, minibar, LCD TV and a private bathroom. It belongs to the standard category. Free Wi-Fi is available in all rooms. Superior double rooms are air-conditioned, larger rooms. They have minibar, LCD TV and private bathroom. Some of them have antique or modern or classical furniture. Free Wi-Fi is available in all rooms. Roomprices contain the rich buffetbreakfast.